1) Lesson details for Monday 16th and Tuesday 17th October 2017. 3) Saturday Buddy Reader Programme - starting Saturday 14 October 2017. Call for Volunteers. We will meet as usual at Dainfern Valley Shopping Centre outside Piatto at 9am on Monday. 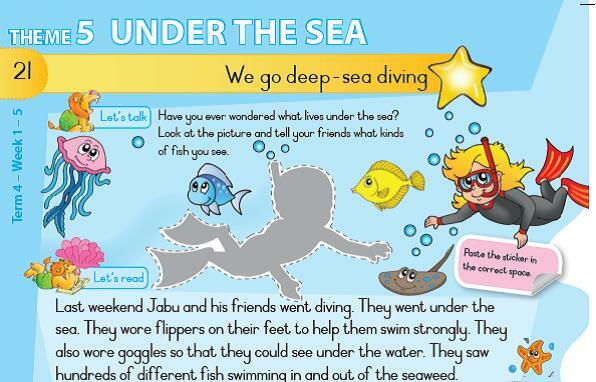 The Grade 3 theme over the next few weeks is "UNDER THE SEA". The focus this coming Monday will be on "sea animals" and aquariums. 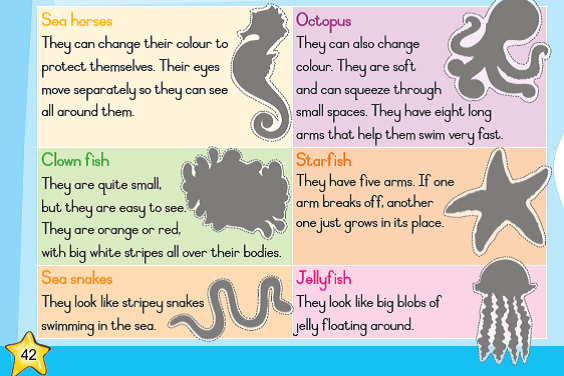 The leaders can ask the learners about the sea animals that they may be familiar with, and then discuss the main animals listed in their workbooks. It may be useful to refer to their workbooks as there would be pictures of the various animals as well as stickers at the back of the books which will help bring the various animals to life. - cut our and hang coloured pictures into the aquariums. - Special visitors are visiting this group on Monday including a teacher from Scotland. Every child in the blue group is going to receive a letter from a child in Scotland and the majority of this lesson will be spent with the kids responding to these letters. - If time the blue group may recap on certain Green level sounds. WE CONTINUE TO "SPREAD A LITTLE LOVE" ON MONDAYS WHERE WE PROVIDE PEANUT BUTTER SANDWICHES AND/OR A BAG OF APPLES FOR THE KIDS AT DCS. Click here to find out how we prepare the sandwiches if this is your first time. We now meet at at 8:30am on a Tuesday in the parking lot outside Piatto's at Dainfern Valley Shopping Centre. We leave a few minutes after 8:30 so that we're able to get to the school for a 9am start. build (segment); manipulate; read (blend) words in the Pink and/or Blue levels working with 3 and 4 sound words. - Baby Club takes place after the Grade 2 lesson. Click here to see what Anthea and the Baby Club are up to. Wednesday 25 October - Food Pantry Distribution. Click here to see what Meghan and Ngangifisa are up to. Thank you Tracy from AKA Sorority Inc. who will be sponsoring and providing the lunch again. Wednesday 29 November - Final Food Distribution for 2017 - unless the school changes this date due to end of term activities. 3) SATURDAY BUDDY READER PROGRAMME - STARTS TOMORROW! Deepa Rai, one of our Tuesday volunteers will be working with the school and Edu Fun to co-ordinate a Saturday Buddy Reading programme with a group of Grade 3 learners at Diepsloot Combined School for the final term. The Grade 3 learners who are a bit behind with their reading to get a boost before the end of the year. Current volunteers to involve their spouses and children in volunteer work. High school children to clock their "community hours" which are compulsory at several schools. Reading Therapists in training to gain practical experience and meet their internship requirements whilst providing 1:1 or small group reading instruction to children who would not be able to afford private lessons, which is a real – win-win. The programme is starting tomorrow Saturday 14 October at Diepsloot Combined School and run until Saturday 18 November 2017. (6 sessions until the end of year). We will meet at Dainfern Valley Shopping Centre at 9:30am on Saturdays and car pool to the school. There will be a brief Buddy Reader workshop for new volunteers on the first Saturday. Thank you to those of you who are able to join us. Please email Deepa on deepa_rai@hotmail.com should you want to sign up for this programme. Smart phones, laptops and toiletries are items that are needed by most students. It is difficult to get second hand lap tops as they are often destroyed to protect confidential data and software. If you're able to access working lap tops where the hard drives have been removed, we will still be able to use them as buying a hard drive is cheaper than buying a new lap top.